After serving in the military, many of our US veterans are always encouraged to join different entrepreneurship programs that may help them grow a successful business after a long term of service they offered and sacrificed for our country. The main reason why all the ex-military members are always pushed to venture into the business is because the skills acquired and needed to survive in the military are exactly the same as those people need to survive in the business world. For veteran entrepreneurs, it is advisable to concentrate on establishing a high credit score both personally and for the business. If your business has its own score, lenders will not only need to rely on your personal score to determine whether you qualify for financial assistance or not. However, one major obstacle that hinders veterans to not engage in entrepreneurship is due to a lack of funding. On the same note, if they have challenged credit ratings it makes it even more difficult for some who need to obtain a small business loan or line of credit. Despite all the aforementioned hardships, it is still good for any veterans to be well informed about the types of loans available for them and how one can apply. Here is a quick breakdown of the different types of business loan programs available for veterans. Are you a veteran entrepreneur who is stuck between a rock and a hard place in terms of business financing? Do you have a business idea that you think can change your life and the life of other people? If your answer is yes, then no need to worry any longer because one of the business loan programs you may apply for is the patriot express loan program. The Patriot Express Loan Program is available for all veterans unless one was dishonorably discharged from the military. In addition, the business will need to be more than 51 percent owned by the veteran. This type of loan is guaranteed by the Small Business Administration (SBA). This means that in case any veteran defaults in payment, the SBA repays the loan back. 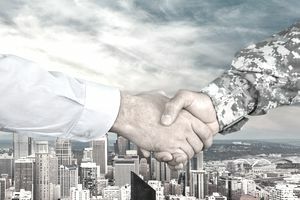 The Small Business Administration (SBA) is one of the most reputable sites in the US highly devoted to helping veterans kickstart the civilian life with ease. This is because it gets updated with every single loan and grant available to veterans. It is full of information not only limited to funds but also education and business mentorship programs that are available. Are you a veteran with a business mind? Do you have a rough idea of what type of business you want to venture into? Be sure to check out the SBA website for additional information and support. This is a type of loan meant to provide working capital to already established veteran-owned businesses. It is good to note that this loan is given to a veteran who has been recalled back to active service. The purpose of the loan is to keep the business running when the owner is away on active military duty. This loan is also guaranteed by the Small Business Administration although the federal law states that for any business to qualify for this loan, it must be in a position to recover and resume its normal operations when the owner returns. The microloan program is meant to assist any veteran whose business is going through a rough patch and needs immediate cash that can cushion the business against harsh economic times. This type of loan is specifically meant to help any veteran-owned business to purchase goods, furniture or to cater for transportation needs. This type of loan is specifically meant for short-term purposes and the maximum any veteran can apply for is only $50,000. Any veteran with an already established business may apply for this microloan. Since the highest amount of capital is only $50,000, the time given to repay the loan is also very short. Thus, if you are a veteran who needs fast cash to boost your business, then this type of loan could be the best option for you. Do you want to increase the working capital for your veteran-owned business? Do you want to buy new equipment or furniture for your business or do you just need more cash to expand your business? Then a microloan may be just what your business needs. One of the sites where you can apply for small business grants for veterans is business.gov. It contains up to date information about different grants for individuals who would like to start their businesses. It is, however, good to note that the grants available on this site are specifically meant to start businesses or improve the current businesses and cannot be used on other things. There is a search icon on the site from where you can search for 'veteran grants' and find links that have current information about grants. Use the resources available to fill out applications. All the above-mentioned loan programs are meant to ensure that veterans can get the support they need to grow their business and achieve success after their days serving in the military are over. The purpose of introducing these types of loan programs is to enable veterans to put all the military skills, values and discipline into use in the business world since it has been proven that all these characteristics are exactly the same set of traits and skills required to succeed in the business world. If you are a veteran out there with a business idea, applying for these loans will provide you with the necessary capital needed to turn your business ideas into reality.